The immunogen used for this product shares 75% homology with TUB (Tubby protein homolog, Uniprot: P50607). 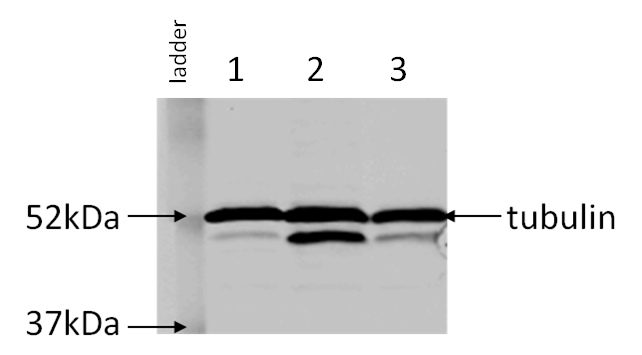 In western blot, we observe a specific band at ~55kDa which is not seen in KO cell lines. An additional band below this band of interest is seen at ~50kDa in both the WT and KO cells which could correspond to the protein TUB. Please note that cross-reactivity with this protein has not been confirmed experimentally. TUB is localized notably in high concentrations in the nucleoli of brain neurons with lower protein levels in the cytoplasm. Please, therefore, be aware that ICC experiments may need to be optimised. Abcam welcomes customer feedback and would appreciate any comments regarding this product and the data presented above. As an alternative antibody, we would recommend our recombinant rabbit monoclonal antibody ab52623 which has been shown to specific in both WB and ICC using KO cells. Synthetic peptide conjugated to KLH derived from within residues 350 to the C-terminus of Human neuron specific beta III Tubulin. WB: HAP1 cell lysate; Mouse brain and hippocampus lysates; rat brain lysate; human brain lysate. 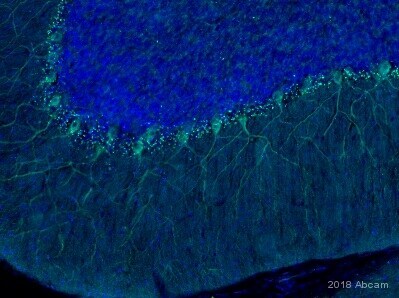 ICC/IF: SKNSH, Neuro-2A and NGF-differentiated PC12 cells IHC-P: Human cerebellum tissue; mouse brain tissue; rat cerebellum tissue; dogfish/catshark head tissue. Flow cyt: U-87MG and Neuro 2A cells. Our Abpromise guarantee covers the use of ab18207 in the following tested applications. Flow Cyt Use 0.01µg for 106 cells. WB Use a concentration of 1 µg/ml. Detects a band of approximately 50-55 kDa (predicted molecular weight: 50 kDa).Can be blocked with Human beta III Tubulin peptide (ab18660). P19 cells either left untreated (top panel) or RA treated for initial 2 days and further cultured for 4 days without RA (6 days, bottom panel) were immunostained with neuron specific β-III tubulin antibody and nuclei were stained using DAPI. 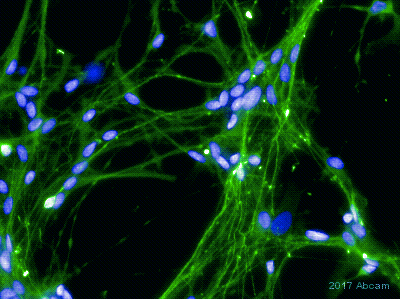 In order to confirm the neuronal morphology, the cells were stained for neuron specific beta III-tubulin (ab18207). 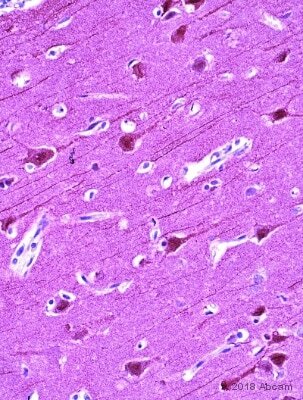 RA induced P19 cells showed immunoreactivity against βIII-tubulin, indicating a neuronal phenotype. In contrast, undifferentiated P19 cells were βIII-tubulin negative. Lanes 1 - 2: Merged signal (red and green). Green - ab18207 observed at 55 kDa. Red - loading control, ab9484, observed at 37 kDa. ab18207 was shown to recognize beta III Tubulin in wild-type HAP1 cells as signal was lost in beta III Tubulin knockout cells. An additional cross-reactive band at 50 kDa was observed in wild-type and knockout cells. Due to the immunogen’s homology with TUB (Tubby protein homolog, Uniprot: P50607), this lower band could correspond to the TUB protein. Please note that cross-reactivity with this protein has not been confirmed experimentally. 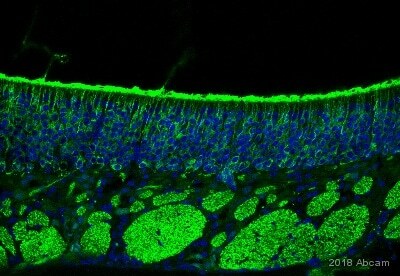 After 7 days of DE induction of WT mice and CD207-dDTR mice, immunostaining for beta III tubulin (green) on a corneal flap mount was performed and compared with a non-DE induced control (CONT). 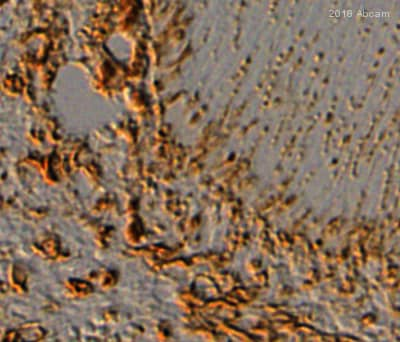 High magnification (× 100 upper row and × 200 lower row) images were taken. The cornea samples were incubated in diluted primary antibody (ab18207) overnight at 37°C. Corneas were then washed in PBS for one hour, and then washed again. Diluted secondary antibody (FITC anti-rabbit ) was applied to the corneas with overnight shaking at 4°C. After two one-hour washes in PBS, corneas were mounted on glass slides with mounting medium. ab18207 staining beta III Tubulin in NGF-differentiated PC12 cells. The cells were fixed with 100% methanol (5min) and then blocked in 1% BSA/10% normal goat serum/0.3M glycine in 0.1%PBS-Tween for 1h. The cells were then incubated with ab18207 at 5μg/ml and ab7291 at 1µg/ml overnight at +4°C, followed by a further incubation at room temperature for 1h with a Goat Anti-Rabbit IgG H&L (Alexa Fluor® 488) preadsorbed (ab150081) secondary antibody at 2 μg/ml (shown in green) and Goat Anti-Mouse IgG H&L (Alexa Fluor® 594) (ab150120) secondary antibody at 2 μg/ml (shown in pseudo color red). Nuclear DNA was labelled in blue with DAPI. IHC image of ab18207 staining beta III Tubulin in Human cerebellum formalin fixed paraffin embedded tissue sections, performed on a Leica Bond. The section was pre-treated using heat mediated antigen retrieval with sodium citrate buffer (pH6, epitope retrieval solution 1) for 20 mins. The section was then incubated with ab18207, 1μg/ml dilution, for 15 mins at room temperature and detected using an HRP conjugated compact polymer system. DAB was used as the chromogen. The section was then counterstained with haematoxylin and mounted with DPX. No primary antibody was used in the secondary only control (shown on the inset). Overlay histogram showing Neuro 2A cells stained with ab18207 (red line). The cells were fixed with 80% methanol (5 min) and then permeabilized with 0.1% PBS-Triton X-100 for 20 min. The cells were then incubated in 1x PBS / 10% normal goat serum / 0.3M glycine to block non-specific protein-protein interactions followed by the antibody (ab18207, 0.01μg/1x106) for 30 min at 22ºC. The secondary antibody used was Goat Anti-Rabbit IgG H&L (Alexa Fluor® 488) preadsorbed (ab150081) at 1/4000 dilution for 30 min at 22ºC. Isotype control antibody (black line) was rabbit IgG (polyclonal) (ab171870, 0.01μg/1x106 cells) used under the same conditions. 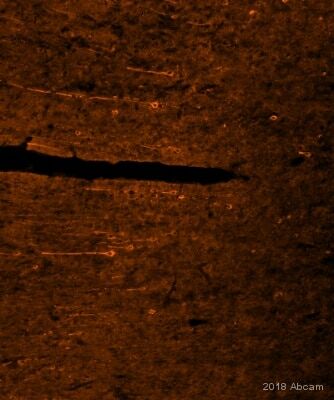 Unlabelled sample (blue line) was also used as a control. IHC image of ab18207 staining beta III Tubulin in rat cerebellum formalin fixed paraffin embedded tissue sections, performed on a Leica Bond. The section was pre-treated using heat mediated antigen retrieval with sodium citrate buffer (pH6, epitope retrieval solution 1) for 20 mins. The section was then incubated with ab18207, 1:2000 dilution, for 15 mins at room temperature and detected using an HRP conjugated compact polymer system. DAB was used as the chromogen. The section was then counterstained with haematoxylin and mounted with DPX. No primary antibody was used in the secondary only control (shown on the inset). Observed band size: 55 kDa why is the actual band size different from the predicted? 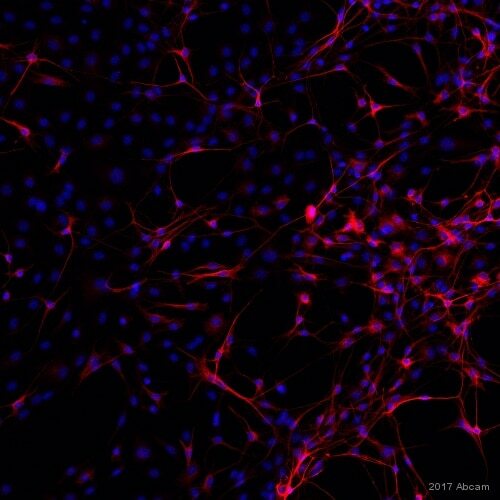 ab18207 staining beta III Tubulin in Neuro-2a cells. The cells were fixed with 100% methanol (5min) and then blocked in 1% BSA/10% normal goat serum/0.3M glycine in 0.1%PBS-Tween for 1h. The cells were then incubated with ab18207 at 1μg/ml and ab7291 at 1µg/ml overnight at +4°C, followed by a further incubation at room temperature for 1h with a Goat Anti-Rabbit IgG H&L (Alexa Fluor® 488) preadsorbed (ab150081) secondary antibody at 2 μg/ml (shown in green) and Goat Anti-Mouse IgG H&L (Alexa Fluor® 594) (ab150120) secondary antibody at 2 μg/ml (shown in pseudo color red). Nuclear DNA was labelled in blue with DAPI. Immunohistochemistical staining (Formaldehyde/PFA-fixed paraffin-embedded sections) for Neuron specific beta III Tubulin antibody - Neuronal Marker (ab18207) on Dogfish/Catshark Tissue sections (head: snout region). Antigen retrieval step: Heat mediated. Blocking step: 1% BSA for 10 mins at RT. Primary Antibody used at 1/2000 incubated for 2 hours at RT. Secondary Antibody: Biotin labelled goat anti rabbit IgG (1/300). 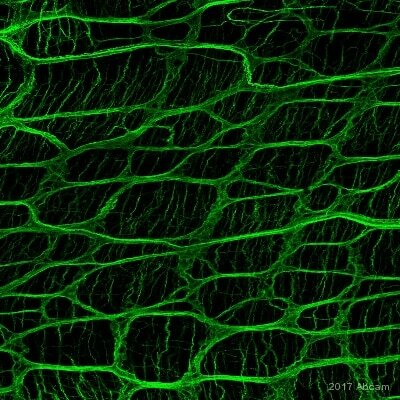 ab18207 staining beta III Tubulin in SKNSH cells. The cells were fixed with 100% methanol (5min) and then blocked in 1% BSA/10% normal goat serum/0.3M glycine in 0.1%PBS-Tween for 1h. The cells were then incubated with ab18207 at 1μg/ml and ab7291 at 1µg/ml overnight at +4°C, followed by a further incubation at room temperature for 1h with a Goat Anti-Rabbit IgG H&L (Alexa Fluor® 488) preadsorbed (ab150081) secondary antibody at 2 μg/ml (shown in green) and Goat Anti-Mouse IgG H&L (Alexa Fluor® 594) (ab150120) secondary antibody at 2 μg/ml (shown in pseudo color red). Nuclear DNA was labelled in blue with DAPI. Overlay histogram showing U-87MG cells stained with ab18207 (red line). The cells were fixed with 80% methanol (5 min) and then permeabilized with 0.1% PBS-Triton X-100 for 20 min. The cells were then incubated in 1x PBS / 10% normal goat serum / 0.3M glycine to block non-specific protein-protein interactions followed by the antibody (ab18207, 0.01μg/1x106) for 30 min at 22ºC. The secondary antibody used was Goat Anti-Rabbit IgG H&L (Alexa Fluor® 488) preadsorbed (ab150081) at 1/4000 dilution for 30 min at 22ºC. Isotype control antibody (black line) was rabbit IgG (polyclonal) (ab171870, 0.01μg/1x106 cells) used under the same conditions. Unlabelled sample (blue line) was also used as a control. This antibody gave a positive signal in U-87MG cells fixed with 4% paraformaldehyde (10 min)/permeabilized with 0.1% PBS-Triton X-100 for 20 min used under the same conditions. ab18207 at 1/2000 staining rat cerebellum tissue sections by Immunohistochemistry (Formalin/PFA-fixed paraffin-embedded sections). The tissue was formaldehyde fixed and a heat mediated antigen retrieval step was performed prior to incubation with the antibody for 16 hours. A biotinylated goat polyclonal antibody was used as the secondary. ab18207 staining beta III tubulin in PC-12 cells treated with venlafaxine hydrochloride (ab120715), by ICC/IF. Increase in the number and length of neurites (stained with beta III tubulin) correlates with increased concentration of venlafaxine hydrochloride, as described in literature. The NGF treated cells were incubated at 37°C for 6 hour in media containing different concentrations of ab120715 (venlafaxine hydrochloride) in DMSO, fixed with 4% formaldehyde for 10 minutes at room temperature and blocked with PBS containing 10% goat serum, 0.3 M glycine, 1% BSA and 0.1% tween for 2h at room temperature. Staining of the treated cells with ab18207 (1 μg/ml) was performed overnight at 4°C in PBS containing 1% BSA and 0.1% tween. A Goat Anti-Rabbit IgG H&L (DyLight® 488) preadsorbed (ab96899) secondary antibody at 1/250 dilution was used. Western blot - Anti-beta III Tubulin antibody (ab18207)This image is courtesy of an abreview submitted by Dr Sergi Bayod. Lysates/proteins at 8 µg per lane. ab18207 at 1/2000 staining mouse brain tissue sections by IHC-P. The tissue was formaldehyde fixed and an enzymatic antigen retrieval step was performed prior to incubation with the antibody for 16 hours. A biotinylated goat anti-rabbit IgG was used as the secondary.